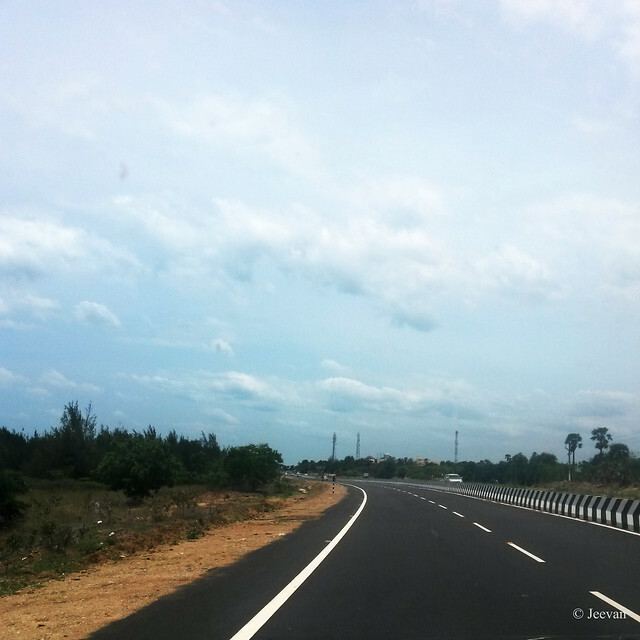 Last week I was on ECR (east coast road) to a temple festival in Mamallapuram with family and it was my travel on this road after some long time and the road wasn’t almost 4 lanes (highway) unlike now when I travel last, but was under extreme widening. The transformation from a pretty 2 lanes to advanced 4 lanes with high divider brought lot of changes on the look, locations and landscape. 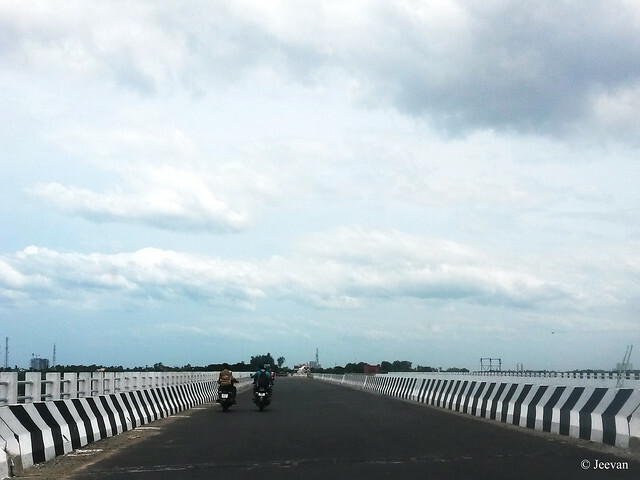 Though ECR is an accident prone road and due to increased traffic, such large scale development is needed but I always go for the former, the scenic double lane road which keeps me inspiring no matter how many times I ride. ECR is one of my favourite routes, not that we stay close to the road and have been frequently hit, I feel pleasure every time I take a ride on this road bearing the cool sea breeze. ECR is packed with entertainment centres and amusement parks to keep one occupied and lately number of showrooms and cafés adds fun to the scenic highway. 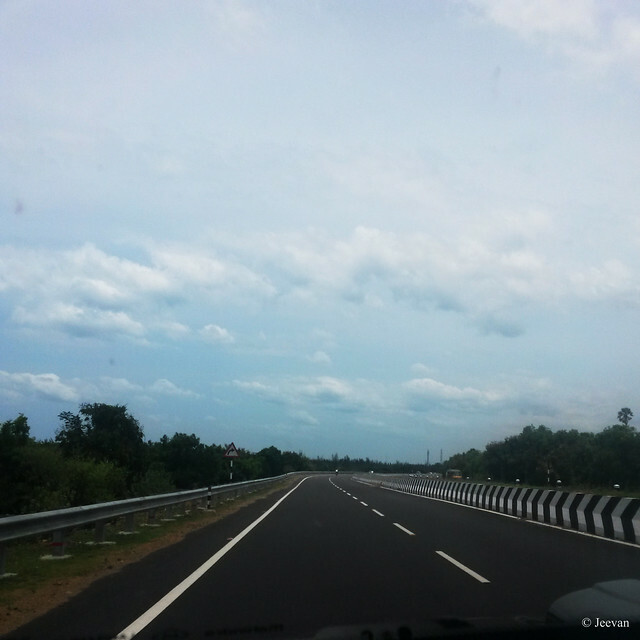 Except weekends, the ECR is mostly traffic free once crossed Muttukkadu, from where the ride is almost close to the coast of Bay of Bengal with Casuarina groves for company. I usually hate riding on national highways mainly because of the bare scenarios that make feel bore… even getting a shadow is rarely evident. Though ECR doesn’t bear many trees to provide shadow or to cut off, but still feel the widening has affected certain aspect of the scenic road. I find the new elevated bridge across the Muttukkadu backwaters got back the undisturbed, picturesque view across the estuary which was latterly hindered by a water pipe that transports the purified seawater to the city purpose. Coming to the road ways, undoubtedly we need smooth roads and protected lanes to travel from a place to another. And in today’s uncontrolled vehicle population (and pollution) road winding is the only option to let all vehicles and drive crash free. But what really happening is the four-lane encourages rash driving, where the need to care about opposite vehicle is almost absent. I wish the ECR comes under speed control, which is the only way to bring down the accidents. Thank you for the tekst and photos! Love the blak white sort of fence! i like the black and white marked edges to hopefully keeps away from the barriers. sorry it is such a busy highway and so accident prone. It is a wonderful highway. The railings are really well designed. I don't think I have seen any that look like these. Loved the vast view of the sky line. The horizon look is impressive. The highways are so wide and clean looking with new tarred surface. BUT--safety and good roads are important --so it looks like you were on a very good one. I have never gone to Ecr but heard so much about . Glad to see the narrow road become wide. But now is the time to plant trees on the sides. That's quite a road, looks like it goes on forever. Magnificent views! I love driving on open highways like these but as you said, road safety is paramount and moderate driving speeds should be ensured for the real pleasure of all. Nice share and photos, Jeevan! Look at those amazing skies...wonderful pictures, Jeevan! We could use new roads like that where I live. Ours have way too many potholes. Nice scenery, thank you for sharing it.